Learn Chinese Online: 怎样用汉语在澳门预订房间？How to book a hotel room in Macau? 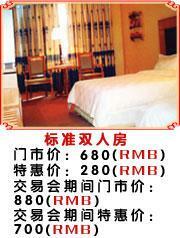 How to book a hotel room in Macau?but I must to email them in Hanyu.. and with hanzi.. I want to book a room for 18 march 2012, for 1 night, and for four beds in a room. and i will arrived in Macau at 9PM. Is there any empty room in that day? We have the room you want. Sorry,the room you want has been booked up. Sorry,we don't have the room you want.